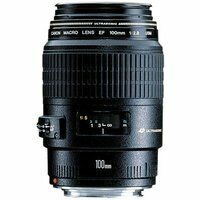 The Canon EF 100mm f/2.8 USM Macro Lens is a medium-telephoto prime lens with a macro feature for 1x magnification. Fluctuations in spherical aberrations caused by focusing are suppressed, and high-quality images are achieved at all focusing distances. With 8 aperture blades, good background blur is obtained even when the aperture is decreased by one or 2 stops.